There is something exciting going on every day here in our area; from downtown festivals to sporting events to live music to craft beer tastings, there's something for everyone. With strong community involvement for each event, guests will have an incredible experience, leaving a lasting impression. This summer outdoor movie series brings family-friendly features to the Dogwood Performance Pavilion in Dogwood Park each Friday in June. Admission is free. Movies begin at dusk. Enjoy live music, bid on fine art donated by regional and nationally renowned artists during a live auction benefiting TTU arts scholarships. Feast on a gourmet cocktail buffet and sample an extensive selection of wine and beer. Take home a commemorative wine glass or pilsner. An open-house event exploring the Appalachian Center for Craft facilities and grounds. A remote campus location of Tennessee Tech University, the center will host a fun, educational and entertaining day with live music, demonstrations, kids' crafts, gallery discounts, and more. Admission is free. Cookeville’s historic downtown square is transformed into a Cajun culinary destination the last Friday of October with live music and more than 75 teams preparing gumbo, jambalaya, red beans and rice. $20 provides a handmade ceramic bowl, all you can eat lunch and funds for Putnam County Habitat for Humanity. Join our #ckvlcanines in Dogwood Park for a day to celebrate your fur-ever friend. Dogapalooza consists of various animal demonstrations, an off-leash play area, an agility course, vendors, activities for owners and dogs, educational areas and a Kids’ Dog Show. Admission is free. Music, midway and more, this almost century-old-event is held each summer and is a favorite of many. The fair offers carnival rides, beauty pageants, a rodeo, livestock and poultry competition, western dance competitions, a strongman competition, a quarter/walking horse show, motorcycle racing, demolition derby, gospel singing and much, much more, all at low or no cost. An annual international CrossFit competition with competitors and spectators from around the world joining 4x Fittest Man on Earth Rich Froning to raise funds to build homes for Mustard Seed Ranch. Taste of the Town is a memorable evening of food and festivities, featuring more than 25 local restaurants in appreciation of CityScape members. CityScape is an organization focusing on downtown preservation and revitalization. The annual home & garden show hosted by the Home Builders Association of the Upper Cumberland showcasing builders, landscapers and home improvement ideas and trends. Wine on the WestSide is an annual event hosted by CityScape with sponsors throughout the community. The event features more than 125 wines and craft beers for attendees to sample. The wine and beer come from vineyards and microbreweries around the world. In addition to these fantastic tastings, there are also food booths from various local restaurants and caterers. The event also features live music and even a beer tasting seminar. Be sure not to miss this memorable event! 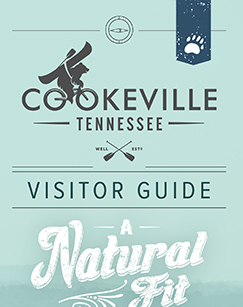 Art Prowl is Cookeville, TN's annual 2 day, free, mostly walkable art tour, Nov. 13 & 14, 2015. Meet 30+ artists in studios, galleries and other locations in Historic West Side and downtown. Featuring the best art in the Upper Cumberland area, plus demonstrations, kids' activities, and ART Prowl specials at local shops, cafes and pubs. Media: Clay, Fiber, Glass, Jewelry, Metal, Painting/Drawing, Print making, Sculpture and Wood. ART Prowl supports local artists, businesses and art education, and integrates art into our community. Support your local artists - join us! The annual BlueCross Bowl State Football Championships, held each December at Tennessee Tech University's Tucker Stadium, feature the best of the best in high school athletics competing for the state title. Fans from across the state and beyond converge to cheer on their teams and enjoy all that Cookeville and the Upper Cumberland have to offer. Christmas in the Park kicks off to welcomes guests to Dogwood Park to “flip the switch” on the community Christmas tree and light display. Select one of four scenic race routes along the Blackburn Fork State Scenic River for the Cummins Falls Marathon. Full-Marathon, Half-Marathon, 10K, and 5K raise funds to protect Cummins Falls State Park. Putnam County’s depots welcome passengers from the Nashville area throughout the month of October. Join Harleys in Whoville, a parade of motorcycles riding for a reason each holiday season. Staging at Boswell’s Harley-Davidson. Benefiting Cookeville Police Department charity programs. Lend us your ears, for tales under a tent in Dogwood Park. Storytellers from all over will be present to delight guests for this all-day event in Cookeville’s downtown. Admission is free. With 14 NCAA Division I sports programs, Tennessee Tech is home to all the athletic action you can handle. Catch a football game inside newly renovated Tucker Stadium or big-time college basketball inside the Hooper Eblen Center. The university also fields highly competitive baseball, softball, soccer, volleyball, tennis, golf, track, and cross country teams. Cookeville’s premier outdoor music and craft beer festival with more than 80 craft beers to savor in downtown's Dogwood Park. Benefiting WCTE, the Upper Cumberland's PBS station.